Optimize the standard clamp configuration for the task at hand. Grab large, small or irregular objects with greater confidence. You can also follow the bucket farther towards rollout compared to a standard clamp attachment. 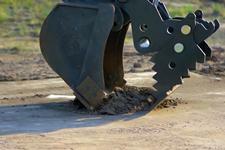 Create a smooth trench bottom with the grading tool, avoiding the need for a second “smooth lip” bucket. 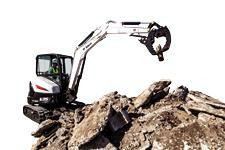 Clean up spoil piles quickly with the grading tool, reducing manual labor. 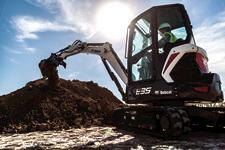 Remove the tool when trenching, giving you enhanced visibility into the trench area. Base Component: Accommodates the standard work tool and optional grading tool. Standard Pin-on Work Tool: Offers multiple positions for grabbing large, small or irregular objects; follows bucket farther towards roll-out. Grading Tool (optional): Serves as smooth cutting edge when grading or trenching with a toothed bucket; may be reversed to serve as a clamshell when paired with a smooth lip bucket. 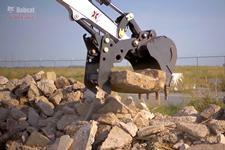 Easy Installation/Removal: Remove work tool when trenching no tools are required. Available in two sizes, the Pro Clamp system includes a base component and a standard pin-on material work tool. Operators may choose the ideal tool position for grabbing large, small or irregular objects without tools. 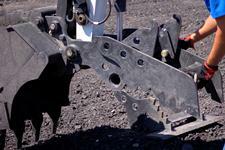 Use the optional grading tool to get a smooth cutting edge when grading or trenching with a toothed bucket. It can also be reversed to serve as a clamshell when paired with a smooth lip bucket. The work tool may be removed when trenching. No tools are required to change or remove the work tool. Many brands of compact excavators offer clamps, but only the Pro Clamp system lets you easily change the orientation of the clamp, giving you the ability to grab differently sized objects. With the optional grading tool, you can use the same attachment to smooth trench bottoms and even clean up spoil. When comparing Caterpillar®, John Deere®, or Kubota® compact excavators, you won’t find anything like it.